If notice your lilac looking a little weak or tired, or it only produces a few small flowers in the spring, you may think your lilac is dying. Many times a plant only needs some heavy pruning and a little food to create thriving new growth and large, fragrant blooms. Work with your plant just after the bloom period when the flowers are spent and drying to revive a lilac bush. Rake away any mulch, dead limbs or dropped leaves from the base of the lilac to clear the surface down to the grass or soil layer. Look over the plant and select three to five of the strongest branches on the lilac. As you select the branches, follow them to the base of the plant and tie a string or ribbon loosely around the base of each strong branch to flag it. Cut all of the un-flagged branches with a clean, horizontal cut about 1 inch from the ground with hand pruners, or a handsaw when necessary. Pull the cut branches away from the lilac carefully so you don’t break off any limbs you want to keep. Remove your sting or ribbons from the remaining branches. 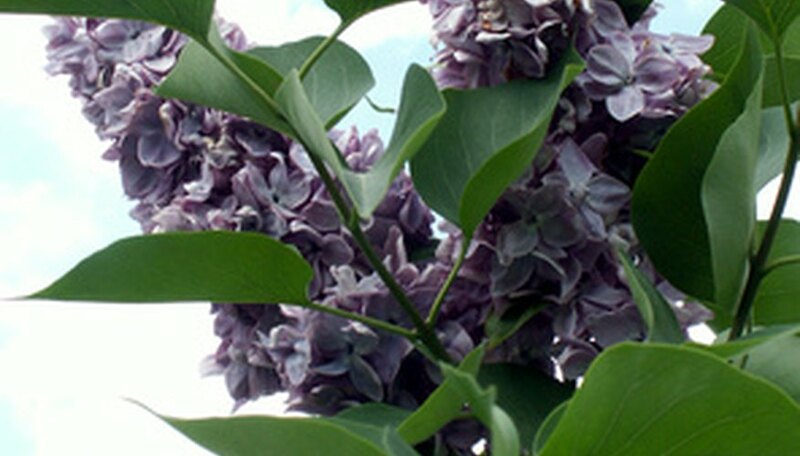 Follow the manufacturer’s instructions for dosage and method of application to fertilize the lilac around its base. Spread a ring of mulch around the base of the lilac no more than 3 inches deep and 3 feet in diameter. If the mulch is too deep, new sprouts won’t be able to reach the surface. Keep the plant well-watered over the summer if your region experiences drought or excess heat. While lilacs need good drainage, they don’t thrive in dry soil. Look for buds to begin to swell on the branches the following spring and reapply your fertilizer just before flowering and again after the flowering is complete. Fertilize in this manner each year. Continue to maintain your lilac by pruning only as necessary each year to remove spent flowers, and remove old and dead branches only every three to five years. For both granule and water-soluble fertilizers, avoid letting the feed come into direct contact with the branches as you apply the fertilizer to the ground around the plant.